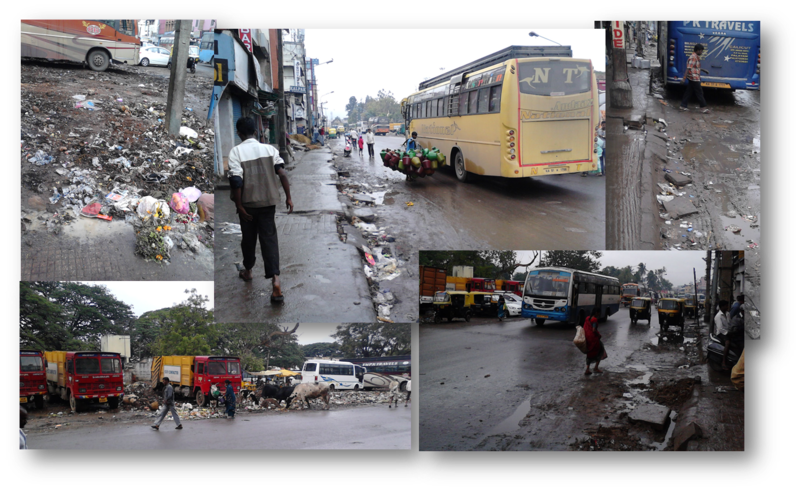 Kalasipalayam is undoubtedly one of the filthiest localities in Bangalore. It’s also a transport hub and several private bust operators have their office here. This means that once a while a city dweller will need to make a visit to this place, either to drop or pick someone up. I was here at 6:00AM today morning to pick some guests who were coming from my hometown. Upon reaching there, I learnt that the bus would be coming only by 8’o clock or so because of some problems on the way. Now I had to wait and having nothing to do I took a stroll around the place. It had been a long while I was here and never have I spent such a long time here. Unable to bear the filth and the stench I abandoned my stroll and decided to settle down somewhere with a pack of cigarettes. I sat in front of a close shop and started watching the crowd moving in front of me. There were sleep travellers, workers, rag pickers, auto riksha drivers and several men and women who didn’t seem to have any identity. What caught my attention was a few mad men who were also moving along. Soon I realized that there were in fact many of them. Some of them were extreme – laughing and talking to them selves, some aloof with an expression of deep grief and most of them looked disconnected from rest of the world. The peculiar thing was that unlike the other crowd, they had some identity about them. As I sat watching these mad men, I could help wondering where they all suddenly appeared from. We normally don’t see mad people in the posh areas of Bangalore, in malls or on the busy main roads. We see rag pickers at the most and not really mad men. And suddenly here were many of them floating in the crowd in front of me. Is it that it was the filth that attracted them all to Kalasipalaya? Can’t mad people put up with a clean surrounding? It was about 7:45AM now and I got up to take some photos for the blog. I started looking around for some mad men to take some pictures. But soon to my surprise I realised that most them had vanished. While there were so many at the day break, I could hardly see any now. I walked through some of those narrow lanes to see if I could find some one to take some photos. And my guess was right, there were quiet a few who had taken shelter in some of the narrow alleys. The locality had by now woken up and was getting ready for the day. And the mad people had vanished quietly from the scene. My notion about mad people so far has been that they are just disconnected from everything else and live a life within themselves. But I realise that, that’s may not be the case. These mad men avoid the civilization; they prefer to live in places that the civilized people despises and they slowly withdraw in to darkness when the civilised society comes to life. They are just moving in the opposite direction. Why? Is it because it the civilized society that calls them mad people? Must be. 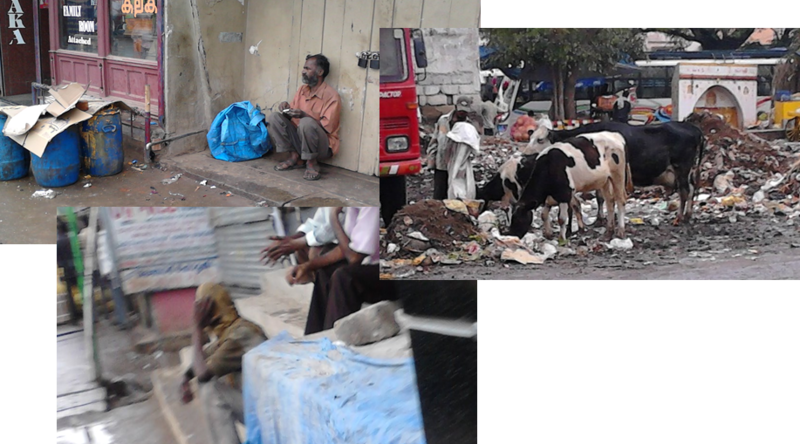 This entry was posted in Culture, Life Around and tagged Civilization, Insane people, Insanity, Kalasipalayam, Mad people, Madness on October 21, 2012 by Sajeev. 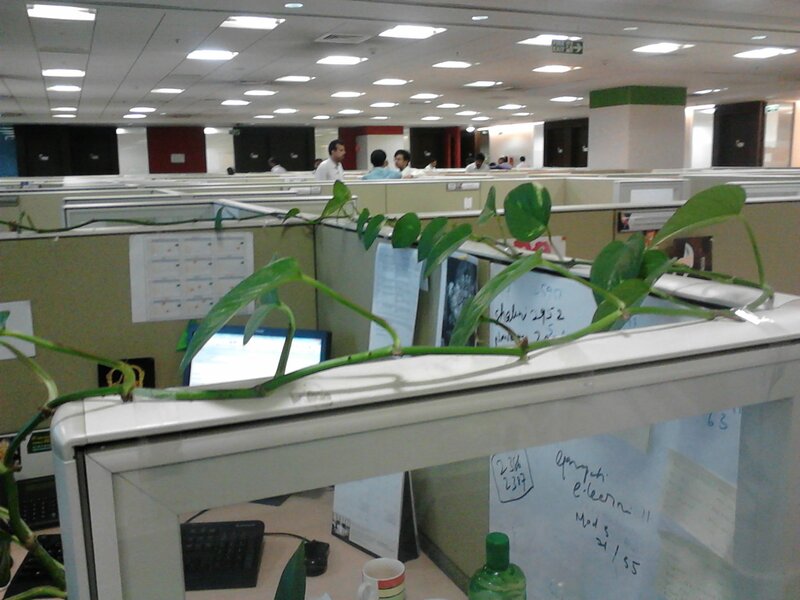 My friend grows a ‘money plant’ on her desk in our office (Money plant is a beautiful creeper with green leaves laced with yellow stripes that is believed to bring ‘money’). She takes good care of it : watering, charting out a course for it to creep (it’s grown quite big now), regularly checking the cellophane tapes that hold it to the cubicle walls and often telling us about how good it looks. Today she was attending to her plant and I was talking to her while she was at it. She normally asks me several doubts – for e.g why do the leaves become bigger as they go higher- and I generously give her my views. 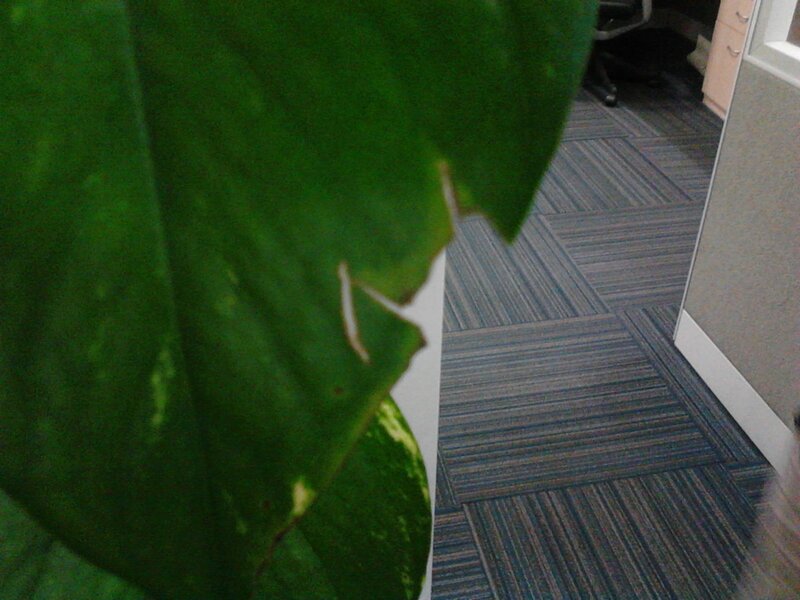 She suddenly saw that one leaf (out of 47 leaves -she told me) was slightly damaged and was concerned about it. When she pointed it to me and asked me how that would have happened, I said smiling ” It’s because you have just one plant, these trivial things matters to you so much”. I have several plants at home and I would never have paid attention to a damage of a leaf -that was insignificant in the whole scheme of things. Of late I have been doing some thinking on happiness (unhappiness to be precise) .Our identity (what we call ‘me’) essentially consists of few components (such as job, family,friends etc) which are given different weightages based on their relative importance. For us to be happy, they all need to be as close as to the desired levels as possible. But if some of them are not as expected, they exert a proportionate downward pull on the overall ‘level of happiness’. That would be to say the ‘overall level of happiness’ is the result of a pull between things going good vs things going bad. If the weight of bad things is more, we would be largely be unhappy. When I had made the comment to my colleague that such trivial things matter because it was the only plant she had, I was suddenly struck by a revelation. The same truth holds good for life too. When we have few things that make up our life, each of them becomes so important that we cannot afford to have even one of them going against the expectation. A single component of our life (the identity to be precise) going wrong would be sufficient to make us completely unhappy. The key to happiness may be then, to have several things that makes up your life so that the relative weightage of each of them would be small and even if one goes wrong, you wouldn’t become unhappy / depressed. This is quiet contrary to what experts in the field tell us – they ask us to pursue that single passion in our lives and that would make us happier. May be some future studies will show that people whose life is made up of several components are less unhappy (even if not more happy) than the rest of the population! But then what if ‘being happy’ is the only thing that matters to us? I think that’s where the road to enlightenment leads to. This entry was posted in Thinking, Uncategorized and tagged Enlightenement, happiness, How to be happy?, Identity, Joy, Me, My Life, unhappiness, what causes unhappiness, What makes up identity on October 19, 2012 by Sajeev.